On offer here is a VERY rare LP (especially in this condition!!!!) by Led Zeppelin called "Led Zeppelin IV (Four Symbols)" and is an ORIGINAL 1971 UK 1st Pressing on the 1st Press Red/Maroon (Plum) Atlantic label!!!! THIS LP IS SERIOUSLY RARE AND VIRTUALLY IMPOSSIBLE TO FIND!!!! THIS IS ONE OF LED ZEPPELIN'S RAREST LPs EVER - AND VIRTUALLY NEVER TURNS UP FOR SALE (ESPECIALLY LIKE THIS!)!!!! JUST TRY AND FIND ANOTHER ONE!!!! THIS LP IS ONE OF THE MOST SOUGHT AFTER LPs ON THE ATLANTIC LABEL AND IS INCREDIBLY HARD TO LOCATE TODAY!!!! BUT WHAT MAKES THIS LP REALLY SPECIAL IS THAT IT IS THIS IS THE 'EARLIEST' 1ST PRESSING OF THIS LP EVER MADE - WITH COMPLETELY DIFFERENT LABELS, THAT ALL LATER PRESSINGS SIMPLY DO NOT HAVE!!!! FINDING AN 'EARLIEST' 1ST PRESSING WITH THESE ULTRA RARE LABELS (WITH COMPLETELY DIFFERENT TEXT & CREDITS!) IS EXTREMELY RARE INDEED, AND ONLY EVER APPEARED ON THE 'EARLIEST' 1ST PRESSINGS OF THIS LP EVER MADE - BEFORE THE LABEL TEXT WAS RADICALLY CHANGED TO THE STANDARD TEXT THAT APPEARS ON ALL LATER PRESSINGS!!!! AND THIS MEANS THAT FINDING ONE OF THESE ULTRA RARE 'EARLIEST' 1ST PRESSINGS (WITH COMPLETELY DIFFERENT LABELS!) ON THIS LP IS ALMOST IMPOSSIBLE - AS BARELY ANY WERE EVER MADE!!!! I WILL EXPLAIN!!!! AS MANY LED ZEPPELIN COLLECTORS WILL ALREADY KNOW - ALL STANDARD 1ST PRESSINGS OF THIS LP CAME ON THE RED/MAROON (PLUM) ATLANTIC LABEL. HOWEVER HAVING THIS RED/MAROON LABEL DOESNT ALWAYS INDICATE A 'TRUE' 1ST PRESSING FROM THE 'DAY OF RELEASE' - AS THERE WERE TWO VERY DIFFERENT LABELS USED IN THE 1ST PRESSING RUN!!!! I WILL NOW EXPLAIN THE SIGNIFICANT DIFFERENCES BETWEEN THIS ULTRA RARE 'EARLIEST' 1ST PRESSING (WITH DIFFERENT LABELS!) - AND LATER PRESSINGS!!!! IF YOU TAKE LOOK AT THESE 'EARLIEST' 1ST PRESSED LABELS IN MY PICTURES BELOW - THE FIRST THING TO NOTICE IS THAT THE "UNDER LICENCE FROM ATLANTIC RECORDING CORPN., U.S.A" IS ABOVE THE WHITE LINE IN THE RED PART OF THE LABEL (LATER LABELS HAVE THIS TEXT INSIDE THE WHITE STRIPE!) - EXACTLY THE SAME AS ALL EARLIER ATLANTIC LPS (LIKE LED ZEPPELIN II FOR EXAMPLE). THE SECOND THING TO NOTICE IS THAT SOME CREDITS WERE ACCIDENTALLY OMITTED ON THESE EARLIEST 1ST PRESS LABELS!!!! IF YOU LOOK BELOW AT THE SONG LISTING ON EITHER LABEL, IT MISTAKENLY HAS PRINTED 'KINNEY MUSIC LTD' ONLY. THIS WAS A MAJOR OMISSION - AS ON ALL LATER RED/PLUM LABELS (INCLUDING THE MUCH LATER GREEN/ORANGE RE-ISSUES!) THE CREDITS WERE CHANGED TO - 'KINNEY MUSIC/SUPERHYPE MUSIC INC' (WHICH IS HOW THEY SHOULD HAVE APPEARED IN THE FIRST PLACE!). HOWEVER THE BIGGEST DIFFERENCE ON THE LABELS IS WERE THE IMPORTANT TEXT 'LED ZEPPELIN' IS POSITIONED & ALSO THE EXTRA 'PETER GRANT' CREDIT (LATER REMOVED)!!!! ON THESE MEGA RARE 'EARLIEST' 1ST PRESS LABELS THE TEXT 'LED ZEPPELIN' IS POSITIONED TOWARDS THE BOTTOM OF EACH LABEL AND IS IN SMALL 'THICK' TEXT!!!! WHEREAS ON ALL LATER LABELS THE 'LED ZEPPELIN' TEXT IS SLIGHTLY LARGER (AND IN THINNER PRINT!) & IS POSITIONED TOWARDS THE TOP - JUST BELOW THE FOUR SYMBOLS!!!! THESE EARLIEST 1ST PRESS LABELS ALSO HAVE A 'PETER GRANT' PRODUCTION CREDIT AT THE BOTTOM OF EACH LABEL - WHEREAS THIS WAS REMOVED ON ALL LATER LABELS!!!! SO THERE IS ABSOLUTELY NO DOUBT AT ALL - THAT THIS IS THE 'EARLIEST' & RAREST 1ST PRESSING OF THIS INCREDIBLE LP, THAT YOU CAN POSSIBLY GET!!!! NOT ONLY THAT - BUT THIS LP TRULY IS FROM THE VERY FIRST 'BATCH' OF LPs THAT WAS EVER MADE, HAVING THE 'EARLIEST' 1ST PRESS 3/3 MATRIXES, AND THE 'EARLIEST' 1ST PRESS 'UPSIDE DOWN FEATHER' ON THE SIDE TWO LABEL!!!! NOT ONLY THAT BUT THIS LP IS IN ABSOLUTELY AWESOME CONDITION - AND HAS BARELY BEEN PLAYED AT ALL!!!! JUST TAKE A LOOK AT THE PICTURES!!!! THIS IS THE ORIGINAL 1971 UK 'EARLIEST' 1ST PRESSING ON THE 'EARLIEST' 1ST PRESS RED/MAROON (PLUM) LABELS (WITH COMPLETELY DIFFERENT TEXT & 'UPSIDE DOWN FEATHER'! ), 'EARLIEST' 1ST PRESS FLIPBACK 'TEXTURED' INNER SLEEVE, 'EARLIEST' 1ST PRESS 3/3 MATRIXES, AND 'EARLIEST' 1ST PRESS GATEFOLD 'MATT' COVER!!!! THIS LP IS SERIOUSLY RARE AND VIRTUALLY IMPOSSIBLE TO FIND LIKE THIS - SO DONT MISS OUT ON THIS AMAZING OPPORTUNITY!!!! The Cat. No is 2401 012 on the ORIGINAL 'Earliest' 1st Press Red/Maroon (Plum) Atlantic labels (see picture) and is a Stereo 1st pressing (there were NO Monos!)!!!! All the tracks are Pure quality Led Zeppelin at their best!!!! Any fan of Led Zeppelin, or 60s music in general, will want to have this in their collection - especially in this condition!!!! The record labels are in SUPERB condition (see pictures) with NO wear, NO writing, and barely ANY spindle marks AT ALL!!!! IT IS VERY CLEAR THAT THIS RECORD HAS BARELY BEEN PLAYED AT ALL (only 2 or 3 times at the VERY most!)!!!! The vinyl is in AWESOME condition!!!! Most of these 60s/70s LPs had been to a lot of wild parties and are usually found totally worn out, and almost unplayable. This one is NOT and has NO scratches, NO hairlines, NO scufflines, only 2 or 3 absolutely ULTRA light TINY surface traces, and only a VERY few of the lightest paper scuffs only visible under light!!!! ITS AS SIMPLE AS THAT!!!! THE RECORD STILL RETAINS ITS ORIGINAL 'JUST PRESSED' LOOK AND LOOKS AMAZING!!!! It is also great to find that the record plays as STUNNINGLY as the visual with NO pops, NO sticking, NO jumps, NO hiss, and barely ANY crackle AT ALL!!!! The sound quality is simply SUPERB with NO distortion and NO groovewear either!!!! The record must grade MINT(Minus)!!!! AWESOME RECORD!!!! Believe me this record is NOT overgraded in ANY way!!!! I use STRICT RC grading standards - it is not in my interest not to!!!! Brillant!!!! The record also comes in its ORIGINAL 1st Press 'Credits' Flipback 'Textured' inner sleeve which is in STUNNING condition and is completely UNSPLIT with NO repairs either!!!! The ORIGINAL 1st Press 'Matt' Gatefold Cover is in SUPERB condition!!!! It has NO edge wear, NO spinal wear, NO splits, NO sticker tears, NO sticker marks, only VERY slight corner wear, NO ringwear, barely ANY creases AT ALL (cover is VERY flat looking indeed! ), NO rubbing, NO annotations, and NO writing!!!! The opening edges are beautifully straight with barely ANY feathering AT ALL!!!! Even the inside of the cover is in SUPERB condition with NO grubbyness, NO yellowing, NO ringwear, barely ANY rubbing AT ALL, and NO writing!!!! The cover must grade Excellent+ if not better!!!! THIS LP IS SERIOUSLY RARE AND VIRTUALLY IMPOSSIBLE TO FIND LIKE THIS (ESPECIALLY AS THE 'EARLIEST' 1ST PRESSING EVER MADE!) - SO DONT MISS OUT ON THIS INCREDIBLE OPPORTUNITY!!!! HAVE A LOOK AT MY PICTURES - I DO MY BEST TO SHOW THE RECORD FROM ALL ANGLES AND MAKE THE PICTURES AS CLEAR AS POSSIBLE - THERE IS NOTHING TO HIDE!!!! It really is a GREAT looking LP and it is truly rare to find any copies of this MEGA RARE LP!!!! 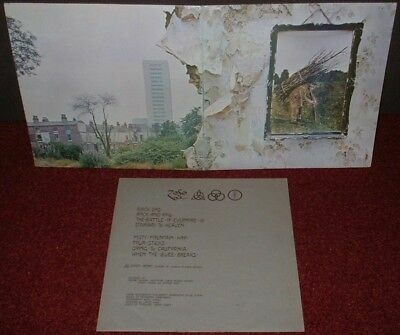 THIS WILL BE YOUR ONLY CHANCE TO BUY AN ORIGINAL 1971 UK 'EARLIEST' 1ST PRESSING OF "LED ZEPPELIN IV (FOUR SYMBOLS)" BY LED ZEPPELIN, IN AWESOME CONDITION!!!! Dont forget to take a look at all my other items including many other TOP LPs and contact me with any queries you may have. Postal discounts for multiple buys are always available - and I guarantee to ALWAYS undercharge on postage! Paypal, Bank Transfers, Cheques, International Money Orders, and Postal Orders accepted. Thanks for looking! Cheers!!!!! Though there are rarely ever any problems with my items (I always try my very best to describe everything exactly!) - PLEASE REMEMBER to contact with me FIRST, if you have any problems at all, before you leave feedback and star ratings, so I get a chance to turn any negative experience into a positive one! I can always happily sort anything out for you, if you let me know you have a problem! This way no one has to leave Negative/Neutral feedback - and we both walk away happy! Please do NOT bid if you cannot give me at least 1 chance to sort everything out to your FULL satisfaction in the unlikely event of a problem. Thanks again - Graham @ XXXRecords. PLEASE NOTE - Private feedback bidders must consult me first prior to bidding - due to previous problems regarding non-payment, and non-receipt. MY POSTAGE UNDERCHARGE GUARANTEE TO ALL BUYERS (I always undercharge on postage! ):- Due to UK Royal Mail's obscene price increases this year - I have had no choice but to increase postage charges a little. Until this year - I had kept them exactly the same since I joined ebay back in 2002. However this years price increases have been so obscene, that I have had no choice but to increase my postage charges for the first time ever. However PLEASE NOTE - my absolute 100% guarantee to you as a buyer - is that I will ALWAYS undercharge postage on everything I send out. Even after the increases, I am still charging you the buyer LESS than I am being charged myself. On each package I send out - the price is clearly stated on the front of the package (please check it when you recieve it!). I also do NOT charge for packaging costs - ONLY for postal costs! And should you find that I have overcharged you postage in ANY way - I will refund DOUBLE the difference. THAT IS MY 100% POSTAL GUARANTEE FOR EACH AND EVERY BUYER! No buyer EVER deserves to be overcharged on postage - and on my listings, I'll make sure they are ALWAYS undercharged. Any questions - please ask!